This helps fill out the picture, complementing the introduction found on the Itinerant Artist Project main page. The NBC Today Show, the Out of Bounds radio show, Art Business News, and American Artist are among the media outlets that have done features on the Itinerant Artist Project. A selection of media links and articles can be found here. What you might want to know - and what I'll want to know - if you're considering being a host for one of my Itinerant Artist tours. See where the Itinerant Artist Project has taken me so far. Or take the First Tour, following an interactive map through a full catalogue of paintings and journal entries from the initial 10,000 mile road trip. The project has allowed me to explore and, to a degree, live out some ideals that I wanted to engage more fully, as an artist and a person. These two very short essays explain a bit more. They are also used as wall text for my traveling project exhibit. Highlights from the Project - almost all of the paintings shown in the jimmott.com portfolio were painted "on the road." Some were given to hosts, and some are part of a collection I periodically exhibit. Limited edition print reproductions of some of the paintings shown in the portfolis are available for sale, to help support the Project. Click here to go back to the main page for additional links and a general introduction to the project. Postcard used to find hosts for the first tour in 2000. Several friends were given several stamped cards and asked to send them to people I didn't know who might want to participate. The back side simply announced: "Itinerant Artist Project, traveling around the US exchanging art for hospitality" with contact info. A Classified Ad in the Nation led me to some of my favorite hosts and most interesting stops. Although I am glad to be able to see and stay with old friends and far-flung acquaintances while touring, the project often feels most rewarding when I'm furthest removed from anyone or anything familiar. Thanks toThe Nation staff, who liked the idea enough to give me a special heading and run the ad for longer than I thought I could afford. Over the last several years I have spent an average of one month per year on the road, as an itinerant painter, traveling through various parts of the United States by car, staying with a series of hosts, painting landscape studies wherever I go, and trading artwork (small paintings) for hospitality (2-4 days room and board). 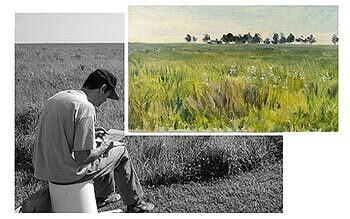 The Itinerant Artist Project (IAP) officially got under way on March 31, 2000, when I set out on a cross-country drive to visit people and places in about 30 locations -- from the Chesapeake Bay to the California coast -- where I'd been invited to paint (see: The First Tour). My hosts were an even mix of old acquaintances and strangers who had heard about the project by word of mouth, an e-mail chain letter, postcard announcements or through a classified ad I posted in The Nation. I met many people I never would have known and saw places I'd never expected to see. For the most part, the painting went well, and sharing my art with people interested in opening their homes to a traveling landscape painter created a rare opportunity for mutual enrichment and exchange. Later in 2000, having survived the first tour and found it as rewarding as it was challenging, I did the first of several New England tours. Over the following year or two I made three additional art road trips. Later in 2002, I returned to my local roots with a NYSCA grant project focusing on farmland and development in western NY. That was followed by a period of short tours and residencies in scattered locations, from Quebec to Arizona. A second round of touring began in the fall of 2006, with a circuit through eastern NY and New England, and culminated in the 2010-2011 hometown ROC-ART tour. A highlight of this period was the 6-week 2007 cross-country tour, which was attracted international media coverage and was featured on the NBC Today Show. Since the 2007 tour, the IAP has developed a focus on exhibiting, artist residencies at schools, public presentations, and other forms of outreach, along with continued touring (approx. one month per year on average). I have also been experimenting with different styles and scales of touring, and other ways of engaging place and community through art. Coming tours may focus on the US-Canadian and US-Mexican border states and provinces and various metropolitan areas, such as NY City, however, the process of generating a tour remains somewhat spontaneous and unpredictable. In general, the location and shape of any given tour depends on where I am able to locate hosts. Unlike the itinerant painters of earlier times, I usually arrange my stops in advance, although I try to keep my schedule flexible enough to allow for unexpected developments (and occasionally tour without a planned itinerary). So far I have logged about 70 weeks of Itinerant Artist touring, with 140+ stops in 38 states. 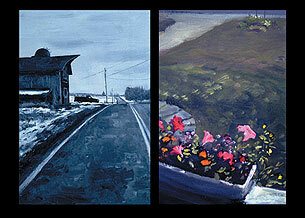 During my time on the road I've completed over 600 small-format oil paintings of the American landscape. Because of its unique challenges and rewards, I expect to devote some time to itinerancy each year for the foreseeable future. With this project I am exploring an unconventional strategy for surviving as an artist, while extending my work to a wider audience. In addition, the itinerancy framework allows me to investigate, through practice and conversation, issues relating to art, value, connection and communication that interest me. I see the project as a cultural experiment; a revival and reformulation of an old American tradition; a welcome chance to practice gift exchange instead of marketing; and an opportunity for me to visit with old friends and new patrons while painting a lot. Note: While this tends to sound mainly like a lot of fun to most people, for me it is actually quite a stretch. In general I am not very outgoing, avoid travel, can't sleep easily in new places. Before my first road trip, I didn't even know if I'd be able to paint in unfamiliar locations. And although a road trip can be an escape of sorts -- an escape from conventional arrangements -- I have gone "on the road" not to break away from community responsibilities or expectations but, in a sense, to find and engage them in ways that are not possible at home. It was above all a desire to do something toward building real connections - between people, between art and life - in an increasingly virtual society that nudged me out on my way (the irony of having a website discussing this is not lost on me, but I hope it serves more to facilitate and encourage direct encounters than to substitute for them).